This week's content-themed Spotify playlist featuring a variety of music from the likes of Butcher Boy, Summer Camp, Guided By Voices, St. Vincent and a few more other such wonderful acts. Click here to listen to it. Summer Camp have kept up the intrigue and interest over the past 18 months or so, with a couple of singles and a well-received EP. Their songs, of course, are the things which grab people, though. It was only a matter of time before they would release a full-length record, and so it was announced this week. It is to be. Of course, the most eagerly awaited album of the year probably goes to St. Vincent. I can't think of any others. Nobody really cared about that Radiohead one, did they? It just kind of happened and then people forgot about it. Anyway, the new St. Vincent song and video dropped at the back end of this week and you can watch it - along with videos from Fear of Men and Low - over here. Butcher Boy are perhaps one of those bands that go unnoticed whilst producing album after album of top-quality material. Hopefully more people will notice them, they are often quite good. Their new one, Helping Hands, is released on Monday and our review of it can be found here. If anybody has any clue what this song is about, then answers on a postcard. In fact, one of the most fun things to do is to go to songmeanings.net and then have a read. The one for this song is superb. You can spend hours and hours on that website. 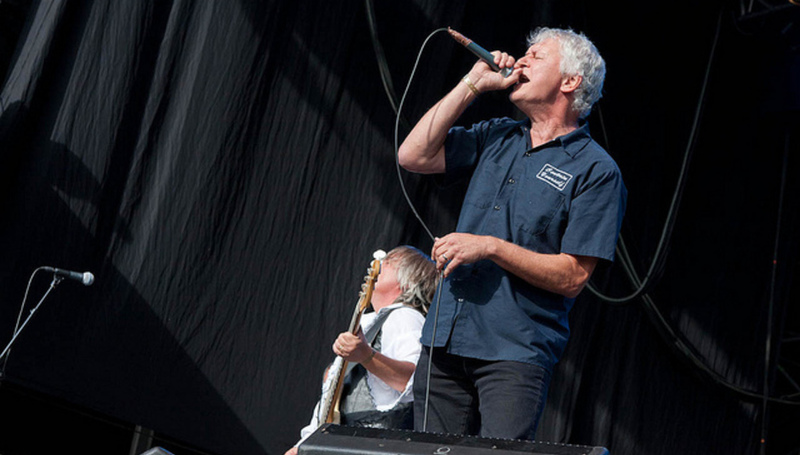 The reason why GBV appear here, however, is because we managed to see them at Oslo's Øyafestival. Single Of The Week, Yo. Wendy Roby writes this: "Warm, beautifully written and road-trippy to the point of bleached, sunburnt bliss, ‘You’re Too Weird’ is one part of a ‘rock album’ with a few bits of ‘the 70s’ and 'country' thrown in and which tells of a life lived to its absolute and utter reaches, observing all who come into its path with an unfussy, empathetic and unpretentious air. At no point do Fruit Bats tear down the genre barricades - but the sheer, balmy delight with which they approach pop music makes me very very happy indeed. LOVE THEM." More here. Beirut's long-awaited return is nearly upon us. It's upon some of us, at least, as we reviewed their new record this week. The Rip Tide continued Beirut's excellent back-catalogue with a richly deserved 8 out of 10. Pavement man Stephen Malkmus is another one who released an album a couple of weeks ago. Therefore, we thought it'd be a good idea to interview him, and it was. Kevin E.G. Perry, as ever, conducted a wonderful interview with Mr Malkmus here, where he talks about a variety of things, Pavement included. Are you always unsure on how to pronounce this artist's name? I am. It's the umlaut. Always throwing us off. Mind you, you don't pronounce Mötörhead any different, nor Hüsker Dü, do you? Anyway, however you pronounce it, there's a new record from them on the way. Read our review of it here. A lot of people beat hard on Jamie Woon, which is perhaps a little unfair. There's some good stuff he's done, no? Mr Woon was one of the acts announced for the first ever Ley Lines festival, which takes place in Oxford later this year. Other acts include Catherine AD, Futures and Hyetal, amongst others. It's kind of neat that DFA 1979 made a return, but also fairly lame at the same time. I do and don't know why bands bother. Still, the least they can do now they've returned is be bloody excellent and, I think, they are managing to do that. They play Reading and Leeds and thus are included in our preview for the bank holiday weekend double-header. This week also saw the return of Articulate Silences, Ambient Sounds column which, of course, is welcome. In the extreme. We're already up to #10, which is pretty impressive. Have a read of that edition here where Barn Owl feature, naturally. Click here to listen to this week's Spotify playlist and here to browse through our extensive archives.